Being happy with what you have while remaining happily motivated. A vital part of being happy and motivated is to truly believe we are given more than the minimum to get by in life. We have more than we need, and more than we could have ever expected. Imagine if we detach ourselves from any assumptions about what we will receive in life from Gd, be it through community, friends, or loved ones. So, does that mean that we have to stop seeking more? Not necessarily – it just means that creating an understanding of this concept will have a direct impact on what you end up with. Knowing that we have more than we need can turn sadness into happiness. Happiness creates gratitude. When the default setting is to appreciate what we have, whatever else we get is a bonus. Thinking we deserve more, or just expecting more, may lead to disappointment and resentment. We have to remember that we came into the world with nothing. Creating a healthy attitude towards an existing phase or an obstacle in life helps us to realize what our minimum requirements truly are. If we have good health, food on the table, and a roof over our heads, we have plenty to be grateful for. Having any or all of these things, even minimally, still puts us ahead of countless people in other less fortunate countries. Many of these people live happier lives than those of us who have plenty. It is all about expectations. The key is to be realistic, and not be overly influenced by our society. Advertisements will try to convince us that we need certain products to be happy. We must have the latest designer clothing, the latest gadgets, a bigger house, a fancy car. In reality – we don’t need any of these things. Need is defined by a feeling that something is lacking. We are focusing on what we do not have. Think about how children respond to receiving gifts. It’s not so much how much they receive, but how much they expect to receive. Some of the toys that our children throw in the trash would make some other child dance day and night. So, we should be aware of our minimum requirements and be happy but place no maximum limit on what we can achieve, because Gd can always give us more. 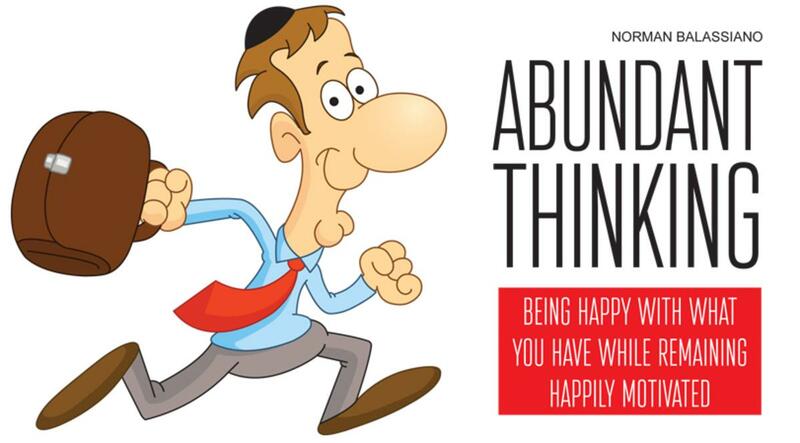 Abundant thinking will remove the shackles of chasing after things we don’t even need. You don’t always get what you want, but if you appreciate the way Gd works, you will get what you need. Anyone who has spent years struggling may find it difficult to be told they can achieve their goals more quickly by doing nothing more than changing the way they think. Abundant thinking asks that we take inventory of what we have and realize how fortunate we really are. Abundant thinking can also help us to develop a healthier and more realistic attitude to those times in life when plans do not work out as expected.